The other night I had the opportunity to see an advance screening of Man of Steel, the latest reboot of the Superman franchise. I was seven in 1978 when the Christopher Reeve version came out. I liked that one, especially the music, and I really liked Superman II. I was intrigued by 2006's Superman Returns, if for no other reason than the teaser trailer, which still excites me seven years later (the movie was a dud). The teaser trailer features the music of the 1978 movie, plus words from Marlon Brando which were not used in the movie. Brando plays Jor-El, who sends his infant son to Earth because his planet Krypton will soon explode. It's all straight forward comic book stuff, but the Superman Returns trailer features familiar theological language for Christians: "...[Humanity] only lack[s] the light to show the way...for this reason about all others, their capacity for good, I am sending you, my only son..." (see John 8:12). Sounds a lot like the Christmas message, yes? Man of Steel understands humanity as in need of salvation. In this version, Jor-El, played by Russell Crowe, knows his son on Earth will have limitless power. When his wife says, "They will kill him," he responds, "How? He will be a god to them." As Christians we understand that God's primary will is to save us. The movie does not make a parallel to Jesus by beating us over the head, but the message is there. When the adult Kal-El/Clark struggles to decide to turn himself in to Earth's unknown invaders, he seeks out his hometown church and pastor. As he talks to his pastor the picture is framed with Clark in the foreground and a stained glass window of Jesus praying in Gethsemane (Mark 14:36), a time of his own struggle before revealing his true self to the world, in the background. During a subsequent battle in space Kal-El exits a spaceship in perfect cruciform, arms stretched out to his left in right. Near the end, Lois Lane says, "You saved me," perfectly summarizing Kal-El's purpose on Earth. Superman is Jesus. With a cape. We've seen movies dabble in Christ-imagery before (Neo in The Matrix and Aslan in The Chronicles of Narnia come to mind). But Man of Steel is different because it embraces, rather than hints at, its themes. The storytellers who brought us this version of Superman (interestingly that name/title is used in only one scene) want us to think about salvation. Kal-El is not just a hero. He is a savior. I'll be interested to see where the inevitable sequel(s) develop, or abandon, these themes. 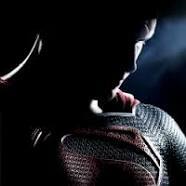 Speaking purely as a fanboy, Man of Steel is great. Great story, great emotion, great action. On its own it is a wonderful movie. Its reflections on the state of humanity in need of saving adds a very important theme for us to consider as we embrace our own need for salvation, and the lengths God will go to bring us to perfection in Christ.